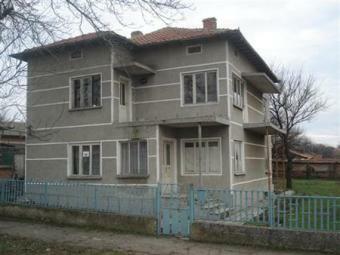 Description: Located in a big village near to the border with Romania. The village is in ecologically clean area with population exceeding 1000 people. The village is quiet and offers beautiful views and access all year round. There are pubs, restaurants, food shops, 24h medical service, petrol station, church and regular bus transport to Dobrich and Varna airport. The solid built house is a two storey one and has a build area of 180 sq. meters with a good size plot of 1100 sq.m. The garden is large and enough to have swimming pool. The house is massive built with bricks and concrete and the roof sound. It is comprises: Ground floor � 2 big rooms, corridor, small room for shower room and toilet, another room connected with other room(probably dining room and kitchen). First floor � the same like ground one - 2 big rooms(one of them with fire-place), corridor, small room for shower room and toilet, another room connected with other room(probably living room and kitchen), two terraces. There is a basement under the house. Extras: Internal stair case, Wooden floors, two entrances and many agricultural outbuildings which could be turned into a guest houses. The property requires just some small cosmetic repair and refreshment in order to become a cozy place for living. There is a good asphalt road that makes the property accessible all year long. Connected to the property is mains water, electricity, septic tank, with telephone and ADSL Internet available. There are extension(two rooms and WC) and premises. Located just 20 miles away from the Black sea coast and the sandy beaches of Krapets and Durankulak. The municipal town of General Toshevo is 8km away where you can find all you need to live and sort your business affairs- accountants, architects, banks, hospital, chemists, frequent bus and rail services to Dobrich and Varna and numerous shops. This is a wonderful village property, suitable for a holiday home or for a full-time residence after some cosmetic repairs! HUGE HOUSE! GREAT BARGAIN !